What do a great horned owl, a bee keeper and a scientist from Monsanto all have in common? They were each special guests at Zitzman Elementary in Pacific, Missouri, on March 30 – along with over 700 local children, parents, teachers and community members. The festivities – a STEM Night brought to fruition with the help of seven College of Education students from the University of Missouri–St. Louis – also featured food trucks, other science and nature experts and a plethora of kid- and family-friendly activities aimed at fostering curiosity and knowledge around all things science, technology, engineering and math. 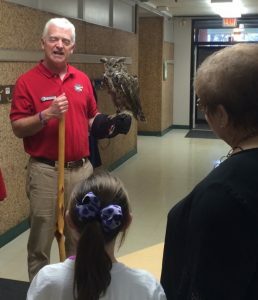 Avian experts from the World Bird Sanctuary in Valley Park, Missouri, introduced several owl friends to the curious students at Zitzman. 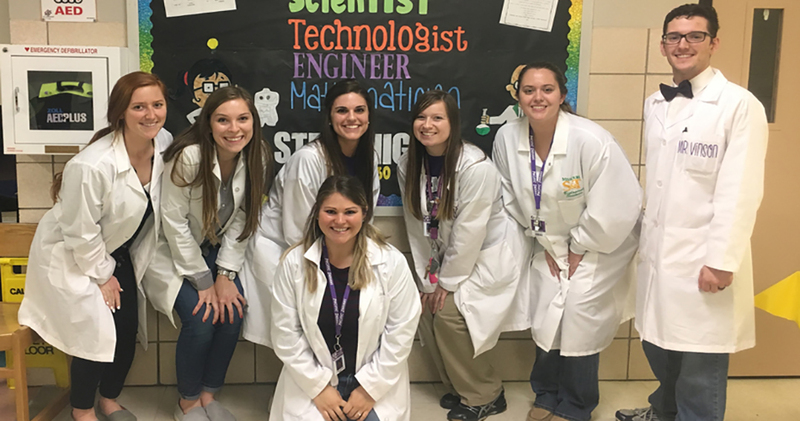 Teacher candidates Ashtyn Boedy, Brooke Elsner, Amy Husenica, Danielle Mueller, Kara Sneeringer, Megan Tate and Adam Vinson planned and designed the STEM night with school Principal Ketina Armstrong. The event was the culmination of months of teaching together as a Studio School team with the students at Zitzman. The STEM night is a great example of what teacher candidates can accomplish in a Studio School setting. The College of Education began Studio Schools more than 5 years ago to replace our former student teaching design. It has proven itself as a model for bringing innovation and collaboration into the schools. All of our Practicum II candidates participate in Studio Schools teams of candidates, clinical educators, teachers, and administrators collaborating to explore, envision, and enact innovative solutions that deepen learning and raise K-12 student achievement. In Studio Schools, teams of teacher candidates are immersed in a school with a group of teachers and other education professionals who are there to support them while supporting k-12 student learning. They become part of the school culture and help to enhance the professional learning communities in the schools. 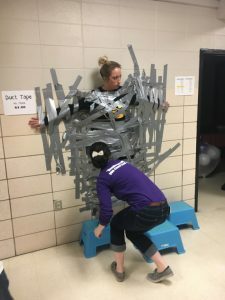 First-grade teacher Meagan Thate (taped to wall) was on the lookout for any young students who wanted to explore the sticky scientific properties of duct tape. Candidates start at the beginning of the semester along with the school staff, participate in professional development throughout the semester and have the freedom to find creative ways to improve student learning outcomes. Support within their own group along with the school’s team of professional educators enhances the candidates’ work with students in a variety of learning contexts. They have the flexibility to develop their own style and explore teaching as part of a professional learning community. The STEM night project was one of many projects that all of our teacher candidates complete through their participation in School Adventure Into Learning – SAIL, a part of our program’s intentional focus on creativity, collaboration and academic instruction. The group of future educators at Zitzman has been pursuing their bachelor’s degree in elementary education with a certification in special education through UMSL’s off-campus program in Wildwood, Missouri, and will graduate this May. Their STEM night was a resounding success. Such ambitions were right in line with one of Zitzman’s most important missions, according to Principal Armstrong, who noted that the school had had other reading- and writing-driven activities recently and was looking to add something science- and math-focused. The UMSL teacher candidates contacted the World Bird Sanctuary whose team offered a daytime assembly full of feathered friends to get the students excited for the evening’s activities. They asked parents and fellow teachers to host interactive, hands-on stations that featured everything from Monsanto’s germination necklaces to toothpick and marshmallow engineering feats to an investigation of the curiously strong properties of duct tape – a particularly popular option which kept one brave teacher stuck to a hallway wall. 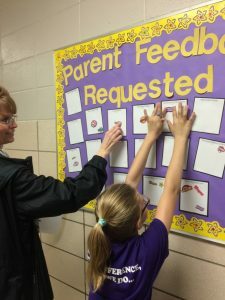 Keeping families involved in student learning and finding curriculum-based activities that can carry over from classroom to home are essential missions at Zitzman. The student teachers kept this at the center of their focus as they designed the night. Finally, they recruited the local food truck vendors who not only took the pressure of worrying about providing dinner off of the parent’s plates but also brought a fundraising element to the evening. That hope is very likely a reality. Armstrong said she’s received such positive feedback from the community – including some lovely phone calls from both parents and grandparents – that Zitzman is already planning on continuing the activity next year. As for the UMSL student teachers, they say they learned just as much as their younger students and got to witness firsthand the power of what happens when a whole team of engaged citizens – from educators and administrators to parents and outside volunteers – comes together for the sake of education. Mueller adds that the experience will definitely be something she will carry with her as she looks forward to graduation and begins seeking out her own classroom to lead.